Scientists Say There’s Not Enough CO2 to Terraform Mars. Elon Musk Thinks Otherwise. The SpaceX and Tesla CEO said, despite recent research findings, that enough carbon dioxide could be harvested on Mars to make it habitable for humans. Our dreams of making Mars habitable for humans might have to wait a while. 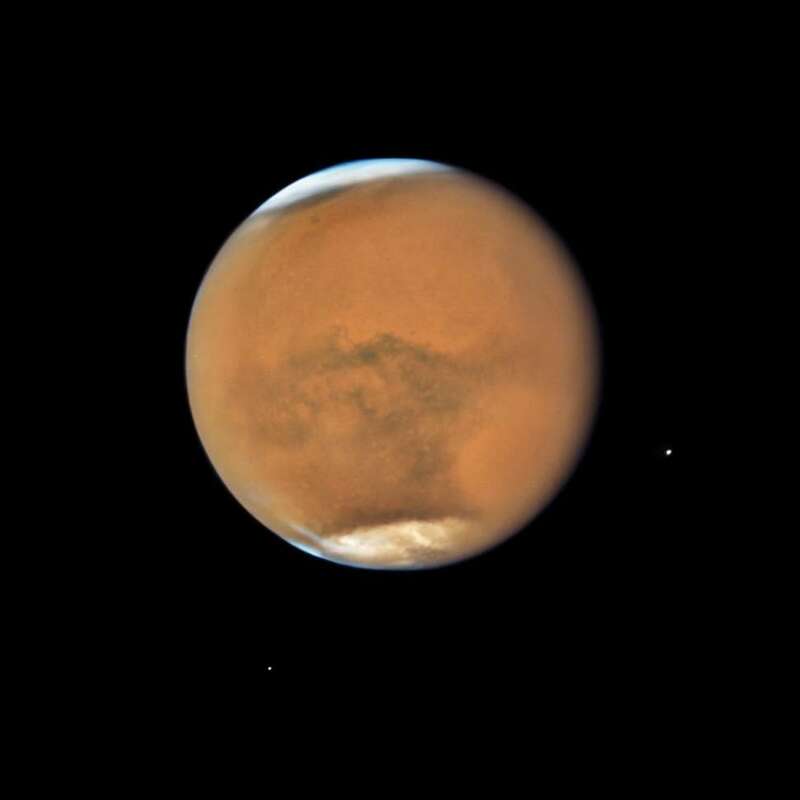 The Red Planet lacks sufficient sources of carbon dioxide to make the planet more Earth-like using currently available technology, according to new research published in the journal Nature Astronomy. Researchers reviewed 20 years of Mars observations, gathered from orbiting spacecraft and surface rovers, with the goal of determining how much carbon dioxide is available for terraforming, the process by which humans might engineer the planet’s atmosphere in order to sustain life. Terraforming the Martian atmosphere, so the theory goes, would require tapping CO2 stored in sources on the surface and below-ground, like rocks and the planet’s frozen ice caps. 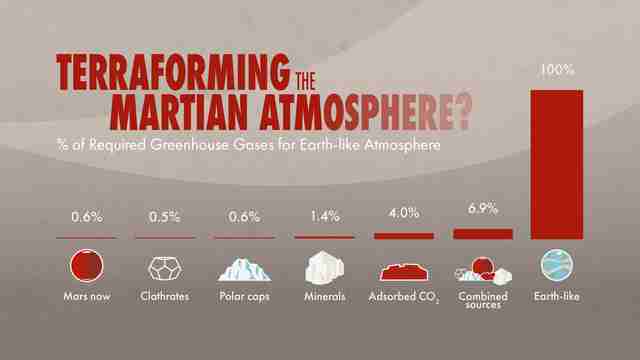 Carbon dioxide is a greenhouse gas, and greater amounts of greenhouse gases in the atmosphere of Mars would increase atmospheric pressure, warm the planet, and allow for liquid water to remain on the surface. But researchers found that harvesting readily available CO2 sources with currently available technologies might only warm the planet by 10 degrees Celsius, far too little to make the frigid air of Mars habitable. "In the popular press, we often read about how easy it is to terraform Mars,” principal investigator Bruce Jakosky, a geologist at the University of Colorado, Boulder, told Seeker. “You know, it's not as easy as people would think." But don't tell that to Elon Musk. The Martian atmosphere was once a lot thicker than it is today, according to observations from NASA’s Mars Atmosphere and Volatile Evolution Mission — MAVEN for short. But charged particles from the sun knocked away some of the lighter isotopes of argon and other molecules. These molecules are like a lid on the upper atmosphere. When present, they keep other gases circulating at lower altitudes. But in their absence, it's easier for the atmosphere to escape into space. What's left is a very thin atmosphere. Recent observations from the European Space Agency’s Mars Express spacecraft showed in the most detail yet how in warm weather, water circulates from the Martian polar caps into the lower atmosphere, which is in turned coupled to the more tenuous outer atmosphere that slowly leaks into space. In cold weather, water in the atmosphere freezes out and lands again on the caps. The cycle is complex, researchers said, but their work showed that the atmosphere of Mars "behaves as a single system." Scientists searched for decades for the presence of carbonates on the surface of Mars. Finally, in 2008, NASA’s Mars Reconnaissance Orbiter (MRO) found deposits of magnesium carbonate in Nili Fossae, a zone that is near one of the planet's largest impact basins. Both MRO and the space agency's Mars Odyssey have observed carbon dioxide in the planet’s ice caps, which could be another possible source for warming up the atmosphere. The authors tallied the inventory of CO2 stores on Mars, which for the most part include the caps and Nili Fossae. They found that CO2 in the soil would require either strip mining or a large amount of heating to release into the atmosphere. The massive ice caps would basically have to be evaporated completely to remove their carbon stores. Their conclusion is surely a letdown for advocates of terraforming Mars: For all the effort, there’s just not enough carbon available to trigger the necessary atmospheric changes to support life. "People at first thought there must be a lot of carbon dioxide [on the surface], because of Mars's thicker atmosphere in the past," Jakosky told Seeker. "But we haven't been able to identify very much." He said even the Nili Fossae carbonate plains — the single largest source of carbon on Mars — have tough rocks that would make it difficult to harvest the CO2 on a large scale. Jakosky acknowledged, though, that future innovations might improve the chances for terraforming Mars. The best method for advancing our knowledge of CO2 inventories on Mars would be a sample-return mission. Luckily, both NASA and Europe's future rovers — called Mars 2020 and ExoMars — are targeted for areas where there might be abundant carbon in Martian rocks. The new research hasn't squelched dreams of making Mars habitable. In a tweet, SpaceX and Tesla CEO Elon Musk — a longtime proponent of Mars exploration — said he disagrees with the conclusions of the new study. "There’s a massive amount of CO2 on Mars adsorbed into soil that’d be released upon heating. With enough energy via artificial or natural (sun) fusion, you can terraform almost any large, rocky body," he said.